You may dedicate your life to golf, but that doesn't mean you must dedicate all your trunk space, too. With the Trunk-It Golf Gear Organizer you can now neatly organize and store all the gear that ends up rolling around in the back of your car. Made of durable 600 Denier and built to last, this organizer is rugged enough for everyday use. Customizable Velcro dividers allow you to create your own storage space to fit your gear needs. As your needs change, the Trunk-It Golf Gear Organizer can change with you. The large shoe compartment is ventilated to allow your shoes to breathe and the top compartment has large mesh pockets for maximum storage. 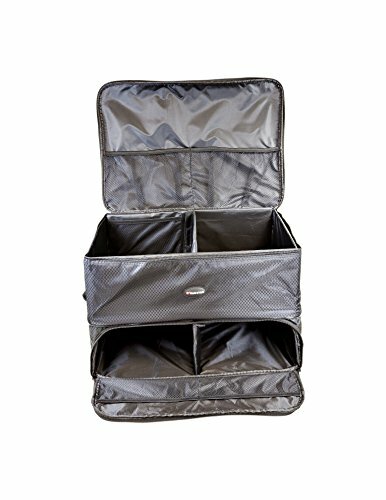 This organizer is perfect for golf gear or anything else you need to store and keep organized in your trunk. LARGE ORGANIZER FOR ALL YOUR GOLF ACCESSORIES The Athletico Golf Trunk Organizer measures in at 17" Wide X 13" Deep X 9" High and can easily store your golf accessories, include shoes, hat, balls, tees, clothing, glove, and more ORGANIZE ALL YOUR ACCESSORIES THE WAY YOU WANT This golf locker comes with multiple removable dividers to customize the storage to your needs. Configure it the way you want to store your golf shoes and other accessories. Mesh pockets on the outside provide easy access to some items with out opening the main locker. The removable top features a pocket large enough to store a tablet or folders, pen/pencil holders, and multiple mesh pockets. When not in use, the organizer folds flat for easy storage. 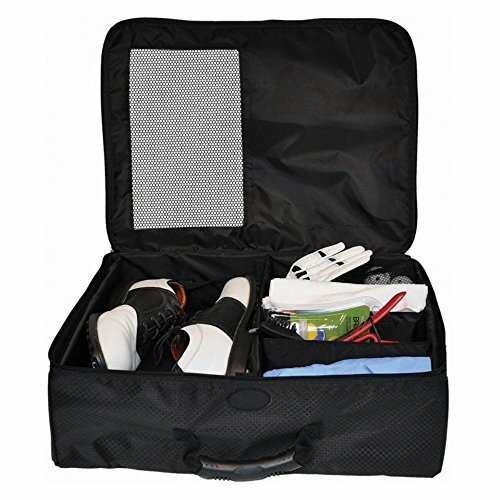 MULTI-USE The Athletico Golf Trunk Organizer can be used for other uses besides golf. This is a perfect organizer for the gym, cleaning supplies, or an auto emergency kit. Load it with jump cables, flash lights, and tools and store it in your trunk to be ready for any emergency. There are multiple compartments to store your car tools and equipment, grocery bags, emergency tools, cleaning supplies, household belongings, etc. Best for SUV, Truck, Auto, Jeep and practically any Vehicle. 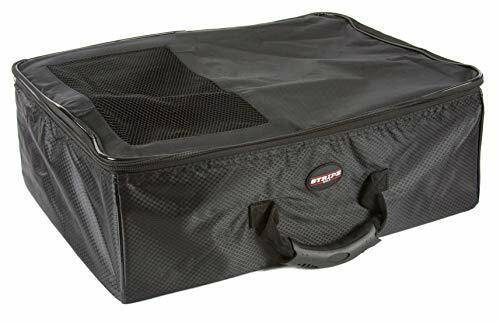 BUILT TO LAST The Athletico Golf Trunk Organizer is manufactured from durable 600D Oxford fabric with reinforced side walls for extra strength and support. The Oxford fabric easily wipes clean and resists water penetration. Keep all your golf gear organized while on the go with the JEF World of Golf Trunk Locker. This compact and convenient storage case features several compartments to help you organize your clothes and gear in one place. The locker is woven from durable black nylon with a heavy-duty zipper and rubber handle. When not needed, the case folds flat for storage. Dimensions: 9W x 15D x 6H in.. Nylon construction. Finish is black. Mesh window for breathability. Conveniently store your golf accessories. Minor assembly required. Dimensions: 9W x 15D x 6H in. The Callaway Golf Trunk Locker is perfect for organizing your trunk or locker. It features easy-access storage compartments with rigid wall dividers and easy-pull zippers. The shoe compartment has mesh for ventilation. Collapses flat for easy storage. Brand: Callaway | Manufacturer: Izzo Golf, Inc. This is our brand Tangkula new and high quality golf Organizer Storage Golf Bag Organizer could organizes all of your golf equipment in a safe and handy manner and youwill never be caught searching for your gear again. Main compartmentfit 1-2 golf bags and the study shelves is used for storing golf tees, hats,shoes, cold weather gear or other golf accessories. It has 3 open shelves foryour medium size gear and 1 close shelf to hold your small items. The feet ofthe golf bag organizer are adjustable for leveling so you can be sure it wouldbe straight in the garage, home, field, or whatever surfaceit's on. Don't hesitate to buy it! Capacity to hold 2 standard size golf bags or 1 extra large golfbag. Enough Roomy: Main compartment fit 1-2 golf bags and the study shelves is used for storing golf tees, hats, shoes, cold weather gear or other golf accessories. You can make your gear in order and would never lose your gear again. 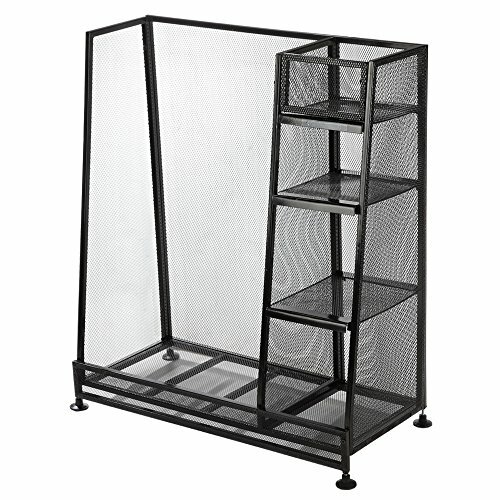 It has 3 open shelves for your medium size gear and 1 close shelf to hold your small items. Easy to Assembe: Do not worry about installation and it is easy to put it together for most people with assembly instruction help. We packed all parts as good as we can, but if there is any parts missing or damaged, please feel free to contact us, we will solve the problem as the way you want. Wooden broad,moisture-proof treatment,long service life, the club spacing is moderate,you can put down 18 clubs. Quick disassembly and assembly, suitable for all kinds of playing places. The frosted antiskid base prevents the scraping of the floor. The Stripe Golf Trunk Organizer conveniently keeps all of your golf accessories and apparel organized for when you are on the go. This trunk organizer is made of durable nylon and easily folds flat for storage. After minor assembly, you will have multiple compartments and features to keep all of your belongings tidy. 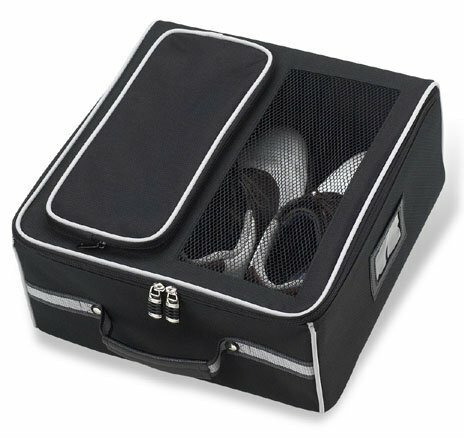 Easily store your golf shoes and all of your accessories in one organized place. Perfect for golf shoes, tees, golf balls, golf apparel, gloves, and other accessories. Mesh panel provides ventilation and air flow for shoes and other apparel. Any golfer always has a lot of golf equipment - besides bags and clubs, you've got balls, shoes, tees, accessories, practice aids and more. 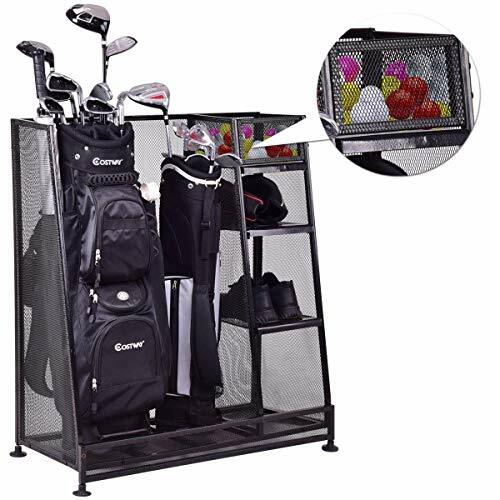 Instead of having them tossed in a heap in the corner, this cost-effective storage rack allows you to securely store two full size golf bags, as well as providing four different sized storage compartments so you can find a home for all your gear. 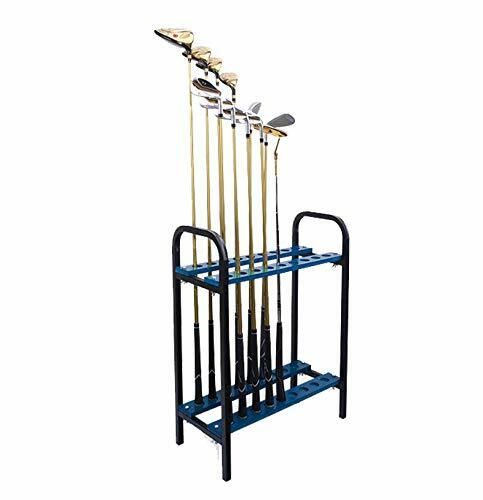 A cost-effective storage rack allows you to securely store two full size golf bags, as well as providing four different sized storage compartments so you can find a home for all your gear. Making your practice more interesting than just hitting shots, Set different difficulty areas, set your own goals, and make yourself more motivated, Use this chipping net set up a score game with friends, Than who is the king of precision, How interesting. Imagine snowing outside or having a strong wind. Everyone is bored in the house. Take this out, hey, let's play a golf game. After a minute, empty out a small space, wow, you can have a few hours of fun game time. Materials: This golf chipping nets make with spring steel frame and glass fiber. Color: Black Size: 32"x27.5"x22" Application: indoor, office, home garden lawn Note: If you are outdoors and have windy weather, please add a little weight behind it to prevent the wind gust hitting the backside and blow it down because this is a light chipping net. Quick Folding Video: You can see this link: https://youtu.be/_F_KQsmOLnU of how to quickly fold the golf chipping nets for you, according to which you can quickly fold the product in less than a minute. ENJOY GOLF - Start a different score pockets game with your friend, family or colleagues, Enjoy golf in a limited space, Use this collapsible chipping net, perfect. EASY INSTALL - Our chipping net use instant pop-up design with the spring steel frame for quickly expanding or quickly fold back up, You can even install it in less than a minute. HIGH QUALITY - Frame use high-quality spring steel, this can be folded for 1000 times, don't worry, no question asked. ABOUT THE PRICE: If you are not satisfied with the goods, you can return them at any time and we'll take a full refund to you and bear the shipping fee, No question asked. The Samsonite Golf Trunk Organizer / Locker helps you keep the trunk of your car neatly arranged. Made of durable ripstop polyester and a waterproof backing, this case also features 2 end carry handles made of ergonomic cushioned rubber. 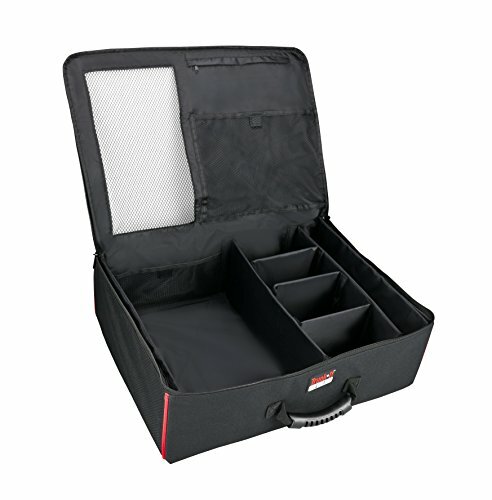 This trunk organizer is available in the color black, and collapses to 2" H, allowing for compact storage when not in use. The top lid organizer has large mesh sections for gloves, tees, snacks and sunscreen. The top level has movable dividers so you can customize your storage needs, allowing easy organizing of shirts, jackets, socks, rain slickers, etc. The bottom level holds 2 to 3 pairs of shoes with compartment dividers. The ventilated mesh front door provides quick visibility, easy access and maximum aeration for drying and airing out shoes. Samsonite Golf Trunk Organizer Keep your golf gear and personal items organized and handy with the Golf Trunk Organizer from Samsonite. Designed for convenience and flexibility on the move, the trunk organizer features a two level, collapsible design with multiple compartments and storage options for all of your belongings. The bottom level of the trunk holds multiple pairs of shoes with separate compartment dividers. A ventilated mesh front door provides visibility into the compartment, as well as easy access and aeration for your shoes to prevent odor build up. The trunk's top level features movable/adjustable dividers that provide up to three different packing sections for easy and adjustable organization. The top lid offers an organizer panel with large mesh pockets and holders for gloves, tees, tools, snacks, and more. Multiple pockets keep valuables like glasses, cell phone, keys, and wallet secure and accessible. Designed for convenience off and on the road, the Golf Trunk folds down flat for storage. Built for the wear and tear of travel, the bag is constructed of a super strong polyester blended fabric that holds up under the most demanding conditions. Self-healing nylon zippers with oversized pulls make closure easy and secure. The bag is equipped with two ergonomic and cushioned carry handles on each end. Store your golf accessories in one convenient place. Double layer trunk locker with sturdy rubber handle. Stores all your golf accessories. Fits conveniently in your car. Helps organize your accessories. Stores flat and assembles in seconds. Storage for shoes, balls, tees, books, shirts, towels and other golf accessories. Business card/I.D. holder and mesh panel for quick drying airflow . 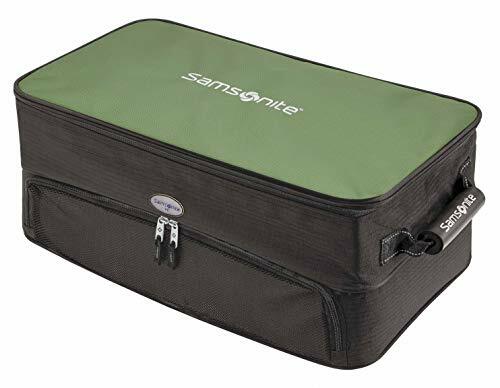 Organize your golf gear and accessories inside this convenient golf trunk organizer from Samsonite. 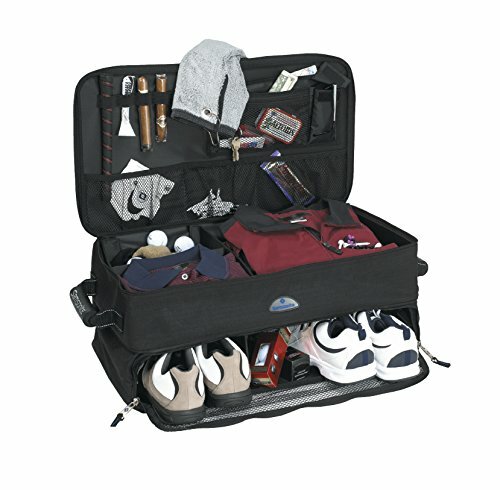 The Samsonite Golf Travel Golf Trunk Organizer is made from rip stop poly fabric with waterproof backing and has a roomy fold down design with two levels that expand to offer you plenty of packing space. The bottom level has divided compartments and can hold up to three pair of golf shoes while the top level has movable dividers to accommodate clothing, socks, or extra layers. Other features of this trunk organizer include an organizer panel in the lid to hold your tees, gloves, or other accessories, a pouch to hold your cell phone or sunglasses, and two ergonomic carry handles. Organize all your golf accessories easily and in one secure place. With the Trunk-It Gear Organizer you can now neatly organize and store all the gear that ends up rolling around in the back of your car. Made of durable 600 Denier and built to last, this organizer is rugged enough for everyday use. Customizable Velcro dividers allow you to create your own storage space to fit your gear needs. As your needs change, the Trunk-It Gear Organizer can change with you. The large shoe compartment is ventilated to allow your shoes to breathe and the top compartment has large mesh pockets for maximum storage. 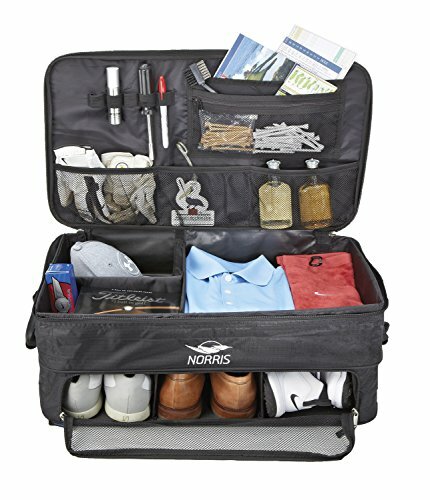 This organizer is perfect for golf gear or anything else you need to store and keep organized in your trunk. 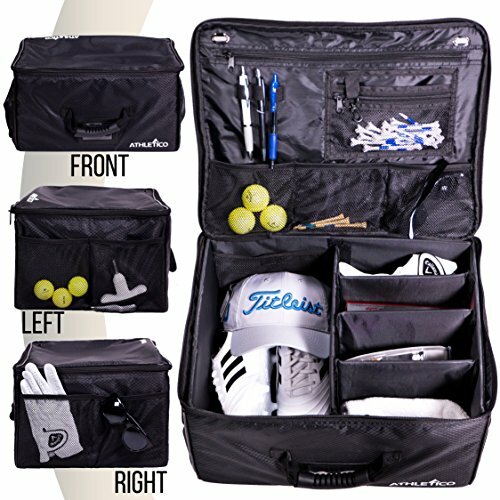 Keep your golf gear organized and accessible with the Trunk It Golf Gear Organizer from ProActive Sports. Designed to fit in the trunk of your car, this storage case carries shoes, balls, and any other accessories you need for the course. The case boasts durable nylon construction with adjustable interior walls that allow you to customize the storage space. A mesh ventilation panel allows shoes and damp gear to breath. A sturdy zipper and carrying handle allow you to secure your gear and carry it easily. 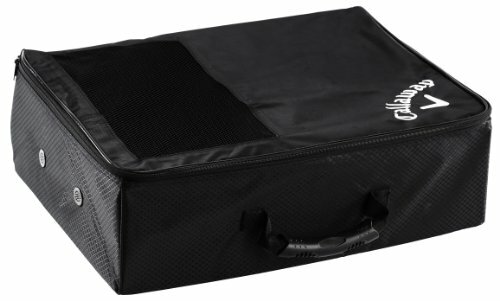 BUILT TO LAST - The Trunk-It Golf Gear Organizer is made of a durable 600 Denier. It features sturdy zippers and reinforced plastic walls for increased strength. ADJUSTABLE DIVDERS - The Trunk-It allows you to customize your storage to suit your needs so you can easily find and access all your gear. CARRY HANDLE - Grab all your gear at once or transfer it to a different vehicle effortlessly with the convenient carry handle. VARIETY OF USES - Trunk-It is the perfect organizer for golf, the gym, cleaning supplies, or roadside emergency kit. Load jumper cables, flashlights, flares, tools, first aid kit, protein bars, and bottled water to be ready for anything.